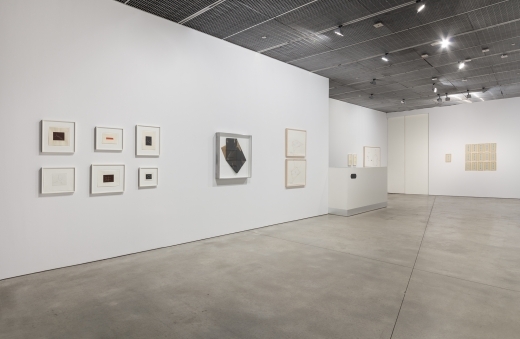 David Nolan Gallery is pleased to present Drawing Space: 1970-1983, on view from November 1 through December 21, 2018. 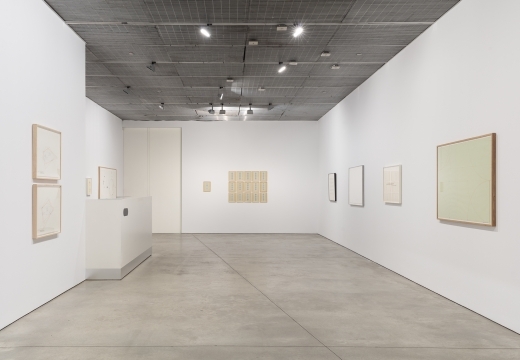 Featuring the work of Hanne Darboven, Barry Le Va, Dorothea Rockburne, Fred Sandback, Alan Saret, and Keith Sonnier, the exhibition takes a fresh look at a group of artists who are variously associated with the Minimalist, Postminimalist, and Process art movements. 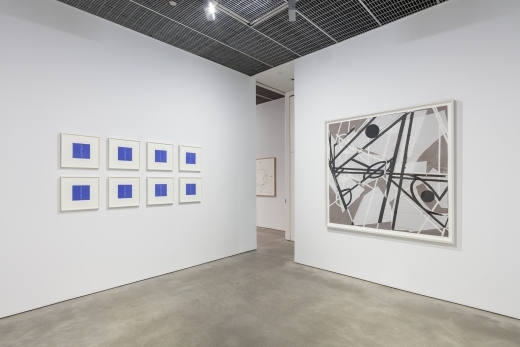 Focusing chiefly on works on paper – some of which are working drawings for sculptures or installations, others that are finished works in themselves – the presentation explores these artists’ relationship to interior and architectural space. 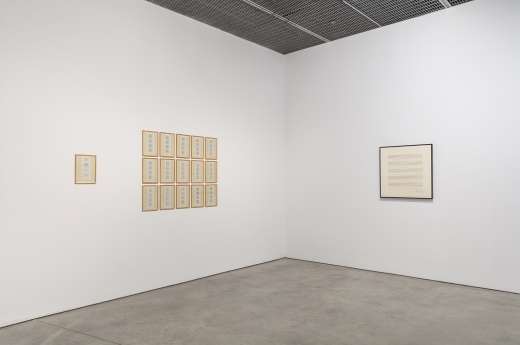 Works in the exhibition by Hanne Darboven (1941-2009) and Fred Sandback (1943-2003) convey Minimalism’s emphasis on seriality and geometric forms. 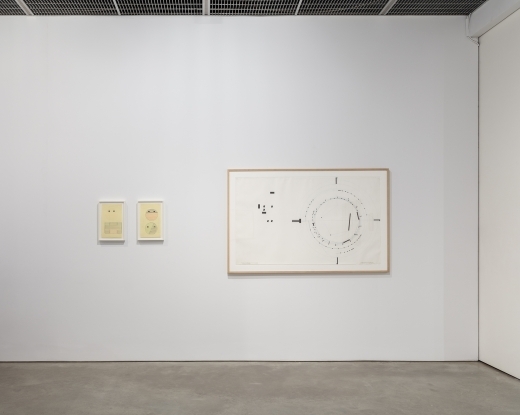 Darboven, who lived most of her life in Germany, spent a brief period of time in New York in the late 1960s, where she formed close friendships with Lawrence Weiner and Sol LeWitt. Darboven’s 10. 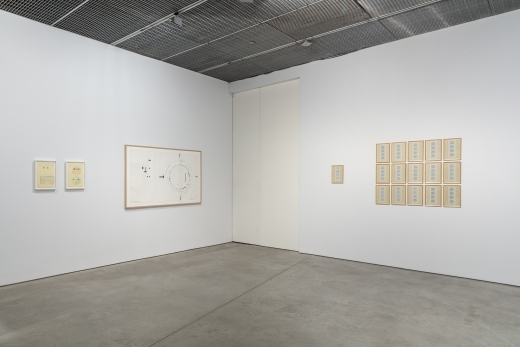 Variante from 1975 – a 15-part work comprised of ink on silkscreen and printed paper collage – features arcs and boxes, using Minimalist language to visualize the passing of time. 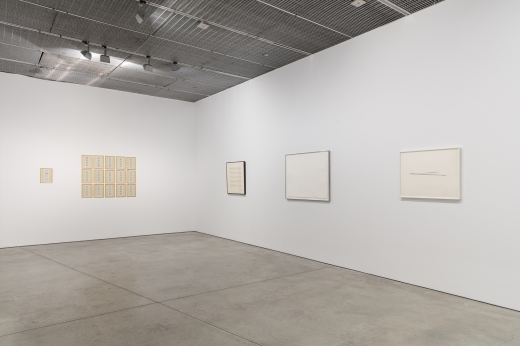 The term Postminimalism was coined by the art historian and critic Robert Pincus-Witten and refers to a reaction by American artists against the closed forms of Minimalism. 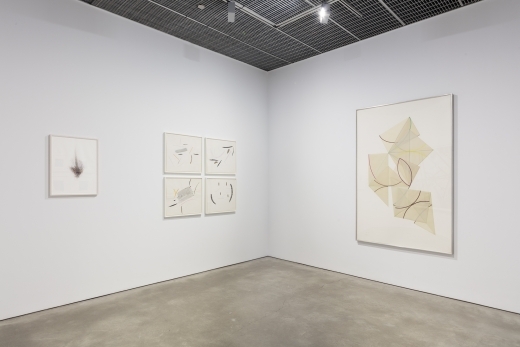 Foregrounding an interest in process, this tendency introduced a human element and level of expressiveness not typically found in Minimalism. The works of Barry Le Va (b. 1941), Alan Saret (b. 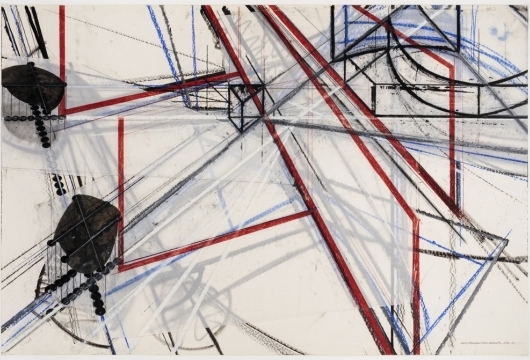 1944), and Keith Sonnier (b. 1941) all share an affinity for unusual materials, calling into question previous conceptions of sculpture. 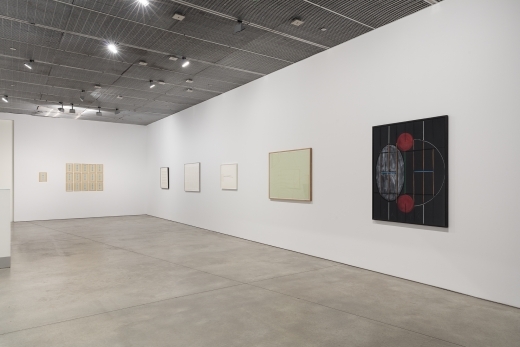 Le Va, in his earliest works, experimented with felt, glass, and chalk; Sonnier with latex, video, and neon; and Saret with wire clusters. 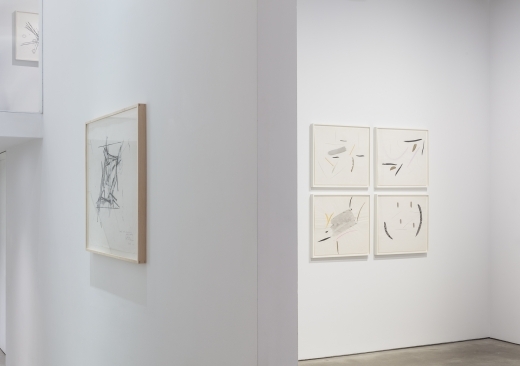 Their drawings open up radical new possibilities in sculpture and provide a limitless structure for articulating ideas about space. Throughout the 1960s Dorothea Rockburne (b. 1932) was involved extensively with dance and mathematics, which remained influential throughout her career. 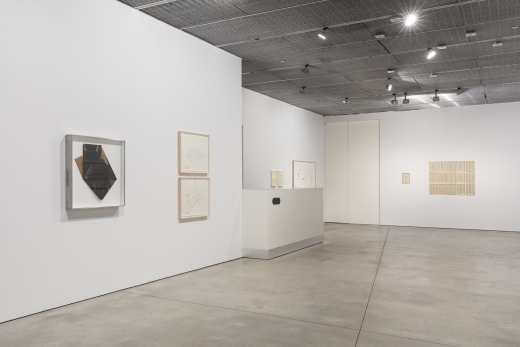 A show in 1970 at Bykert Gallery in New York marked her return to object making, at which point her practice became rooted in an interest in mathematical concepts. 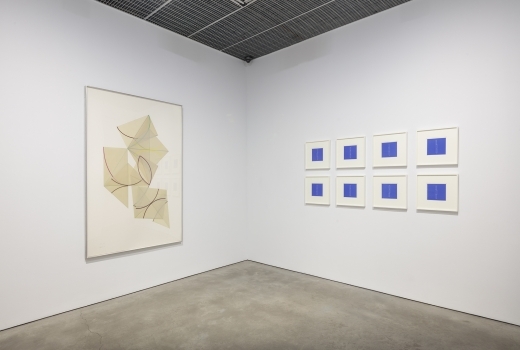 Her attention to linear and geometric forms links Rockburne to the Minimalist artists, while her use of unconventional materials such as crude oil, grease, and tar connects her to questions of process as she explores structural procedures for converting mathematical concepts into physical space. 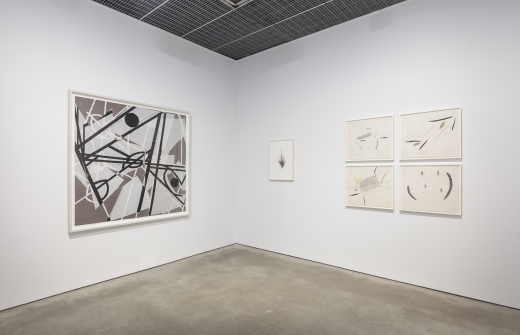 A group show of six sterling artists revisits a long-neglected period of ascetic mentalities and understated procedures in New York. Post-Minimalist, process-oriented, and abstract (of course! 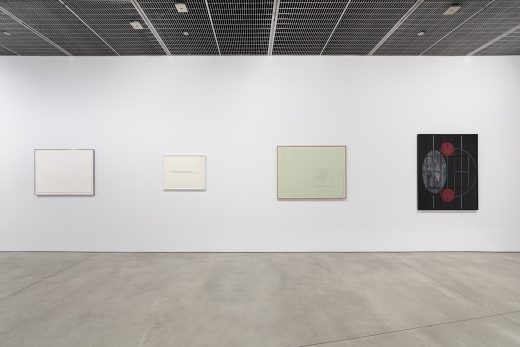 ), these drawings incline to faintness of line and paleness of color (if any) and are saturated with aesthetic intelligence. 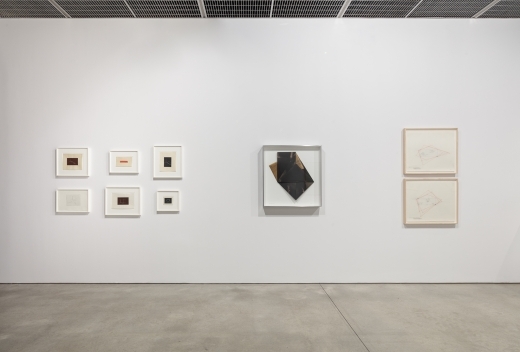 There’s a held-breath integrity to the folded-paper works by Dorothea Rockburne, the graphed numbers and marks by Hanne Darboven, the subtly playful designs by Keith Sonnier, and the geometric sculptural imaginings by Fred Sandback and Barry Le Va. One small, scribbly sketch by Alan Saret, who made ineffable sculptures of jumbled wire, conveys the spirit of perhaps the era’s most sensitive talent. The rigor and hush of these artists is like illumination by moonlight. It could not survive the blinding glare of the neo-expressionist eighties that followed. This show prompts penitence.